I made another quilt top last week. 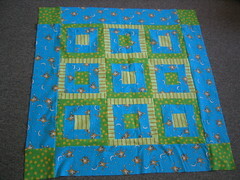 This one from the second volume of Ursula Reikes baby quilt series. It's based on the W block. Of course I say that like I know what that means, but really I am just repeating what I read in the book. Perhaps there is a quilter's wiki out there? Aaaaanyway, I am madly in love with this quilt top. I think there is something to the color combination that must be soothing. The monkeys and the stripes were from stash so hurray for that. Not everything is lining up perfectly just yet, but there is a distant glimmer of hope that someday I might get this right. Crafting abounds around my house. More photos and FOs (and a six word memoir) soon.